Namaz-e-Janaza will be held after Namza-e-Juma in Butrab Imambargha. A young momin Adeel Abbas embraced shahadat in the FC Area when yazidi terrorists opened fire on a General store . Adeel Abbas was former member of Imam Students Organisation Pakistan and had served as the Unit president for the FC area unit as a student . He was a staunch supporter of the cause of oppressed Palestinian muslims and actively participated on the forum of Palestine Foundation Pakistan. The global wahhabi -zionist alliance has been brutally martyring Pakistani Shia muslims for several decades now ,with overt support from government funded militias ,the monstrous creations of yester-years as well as the criminal indifference and connivance of state machinery . In the same incident two other momineen sustained injuries. Martyr's body was later shifted to Ancholi Imambargah while injured are under treatment at a local private hospital. 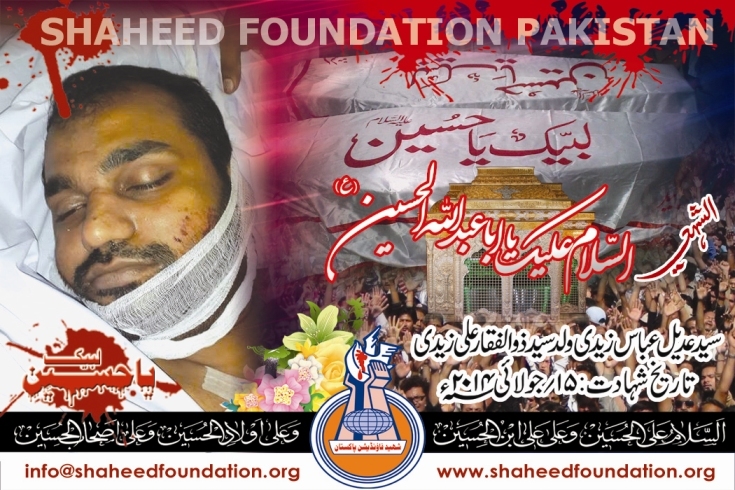 Please recite a fateha for Shaheed Adeel and Shohada-e-Millat-e-Jaffaria Pakistan . Please pray for early recovery of the injured momineen.